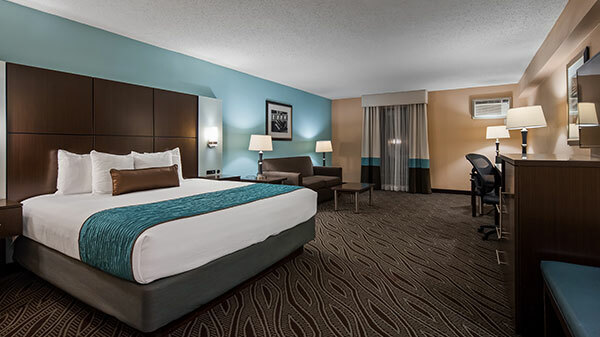 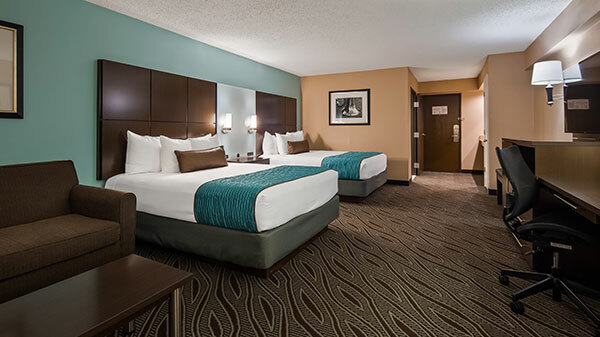 Attractively appointed with modern features like 50” LCD TVs, brand new mattress (2014) and granite countertops, our rooms and suites are designed with your comfort in mind. 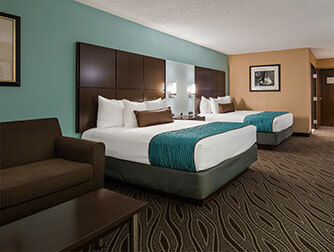 Choose a room or suite that suits your needs and budget and book online today for our best rates. 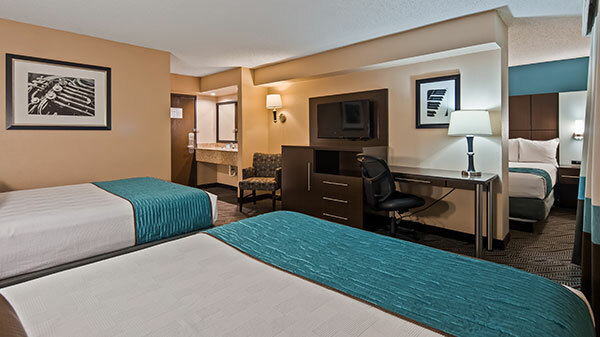 This cozy room makes the most of its small space with a plush king-sized bed, granite-topped vanity, 43” LCD TV, microwave, mini-fridge and office desk. Two comfortable queen beds are yours to relax on in our space-efficient Two-Queen Room which includes a microwave, mini fridge, granite-topped vanity, 50” LCD TV and office Desk. 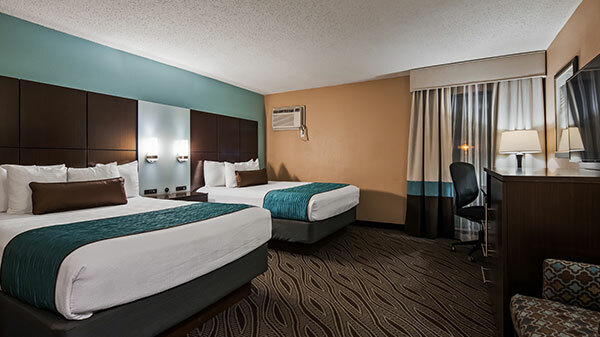 Enjoy added space and comfort in our King Mini Suite featuring a plush king-sized bed, a separate sitting area with a table & two chairs, office desk, mini-fridge, microwave, a granite-topped vanity, two 50” LCD TV. 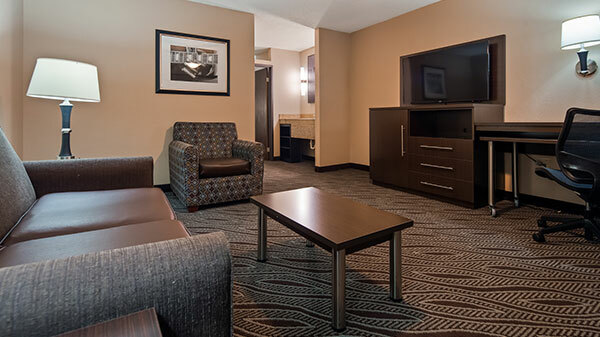 Enjoy added space and comfort in our King Sofa Suite featuring a plush king-sized bed, a full size pull-out sofabed and dining table & chairs. 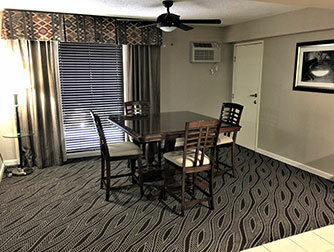 The room includes a office desk, coffeemaker, granite-topped vanity, 50” LCD TV, microwave, mini-fridge and office desk. 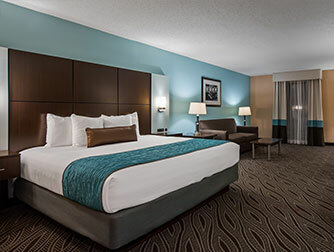 Relax and stretch your legs in our spacious King Luxury Suite featuring a plush king-sized bed and a separate sitting area with a pull-out sofabed, table & chairs, office desk and coffee table. 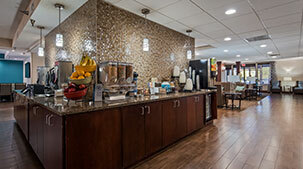 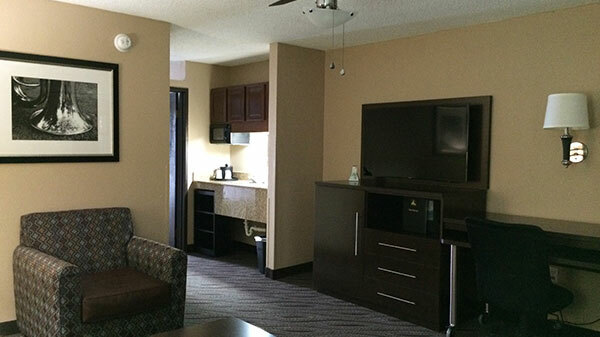 The room includes a granite-topped vanity, two 50” LCD TV, microwave, mini-fridge and office desk. 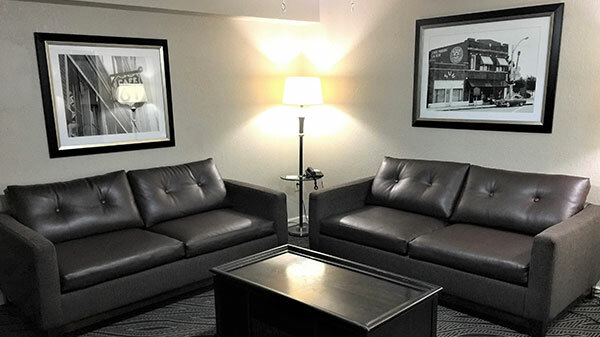 Relax and stretch your legs in our spacious Two-Queen Luxury Suite featuring two plush queen-sized beds and a separate sitting area with a pull-out sofabed, table & chairs, office desk and coffee table. 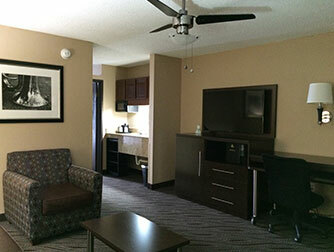 The room includes a granite-topped vanity, two 50” LCD TV, microwave, mini-fridge and office desk. 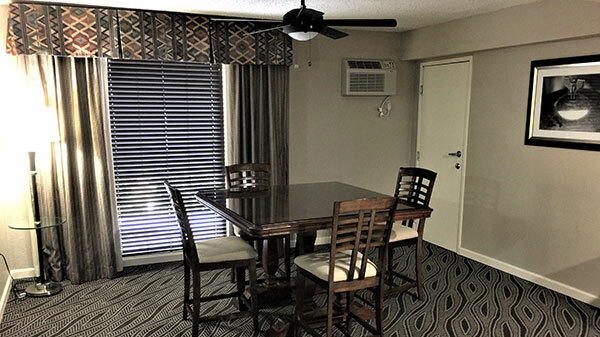 For the comfort and safety of our disabled guests, this wheelchair-accessible room features bathroom rails, raised toilet with grab-bars, closed-caption TV, and visual alarm. 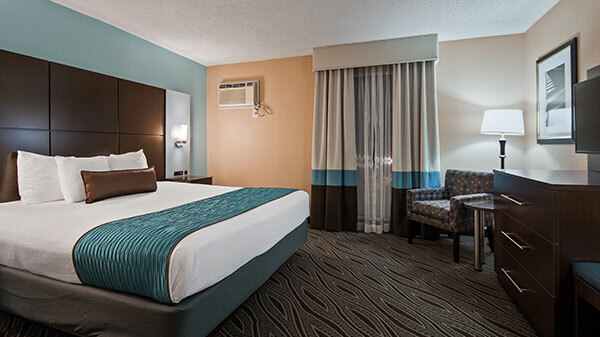 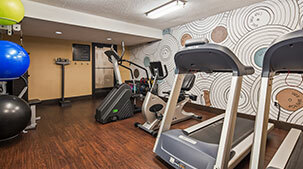 It is furnished either a one king-sized bed or two queen sized beds, a pull-out sofabed and all our standard in-room amenities including a 50” LCD TV, microwave and mini-fridge. This room features the same amenities, plus different bed types for the whole family. 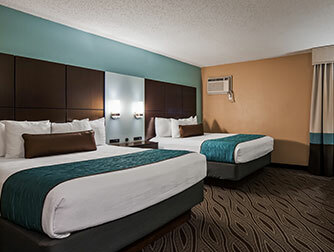 The room offers two Queen or a King Bed and a Twin bed. 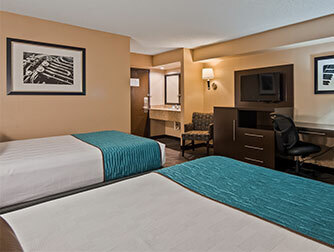 This modern room will accommodate a family travelling together. 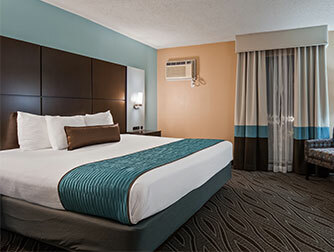 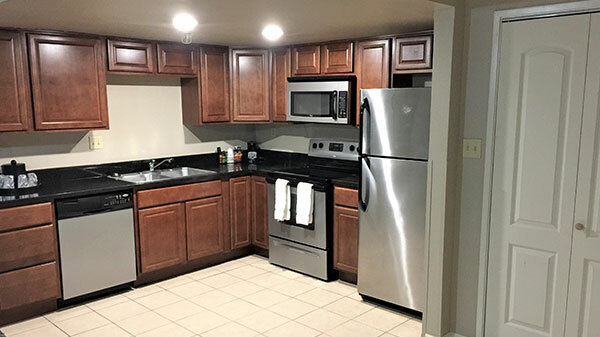 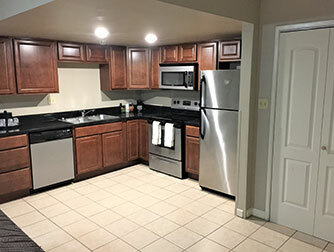 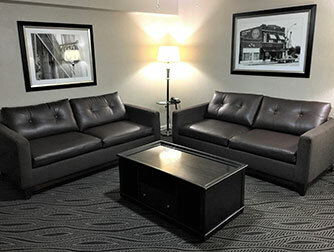 The Executive Suite is the newest room type to the hotel and features two queen beds and a separate living area with kitchen, dining, and in-suite laundry. 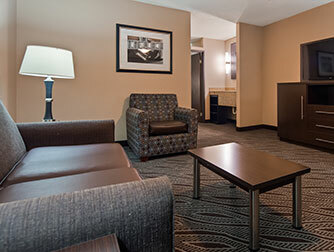 An Executive Suite room is very spacious, and all amenities of the other room types are included in the as well.